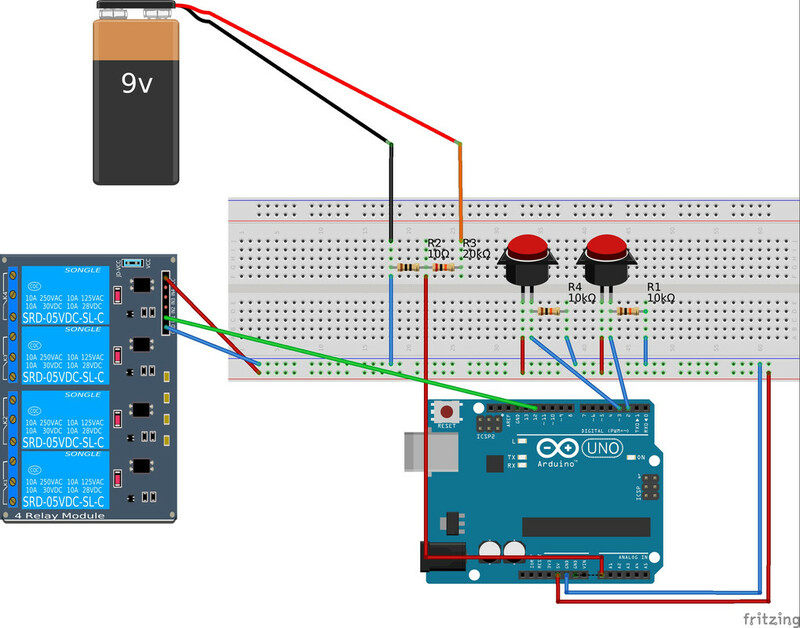 I have two simple circuits made up on a breadboard using my Arduino UNO. I have one circuit with two push buttons, setup to switch a relay on and off. Either button turns the relay off/on depending what it already is. This works great. My other circuit is made up using a simple voltage divider of 10kΩ and 20kΩ which allows me to read my vehicle voltage safely up to 15v. The issue I have is when I'm presenting an external 12v to the voltage divider, if the relay circuit is turned off I get 12.9v, and if I turn the relay on, I get 12.5v. My guess is that the internal reference voltage of 5v is fluctuating because of the relay circuit, but I have no idea why, or if this is normal, or what I can do to isolate each part of the project. I intended on adding 3 more relay circuits too so without testing further I'm guessing these will have more of an impact on the readings? Maybe you could try connecting the Aref pin to the 3.3V pin. This one has a second voltage regulator, so it won't be influenced by the 5V circuit. Would a ratio of 10kΩ and 40kΩ be what I need based on 3v? 15V with a voltage divider of 39K and 10K will give you 3.06V, so that's alright. A straight connection between Aref and 3.3volt could be unhealthy for the Aref pin if you forget to set Aref to EXTERNAL. See the Aref page in learning>reference. Better drop the battery voltage to ~1volt, and use Arduino's inbuild 1.1volt bandgap reference. Forget about Instructables, unless you know exactly what you're doing. A zener diode is is useless. It won't protect the analogue pin when the Arduino is off, and it could introduce errors. I assume you're using a proper relay driver, and a kickback diode across the relay. I've attached example code that uses the internal 1.1volt Aref, and averaging. The analogue pin stays under 5volt with input voltages up to ~75volt if you use the resistor values from the sketch. How are you powering and driving your relays? // will quickly become a bigger number than can't be stored in an int. You are using a 10R and a 20K resistor for your voltage divider. This is incorrect, take a look at Wawa's code: use 6.8K and 100K respectively. And you didn't use "analogReference(INTERNAL);" in your setup. Also, you are using external pull-down resistors for your buttons, that's completely unnecessary: all Arduino's have built-in pull-up resistors. Read more on how to take input from a button here. Sorry, that's what I have before going through all your feedback so I haven't made any changes yet, it's what I have as of my first post. I didn't realise they had built in pull up resistors so that's very useful to know. I got that one from one of the arduino beginner tutorials but I can't find the link now unfortunately. I'm hoping to have some time to go through all your feedback tomorrow and rebuild my circuit and code.